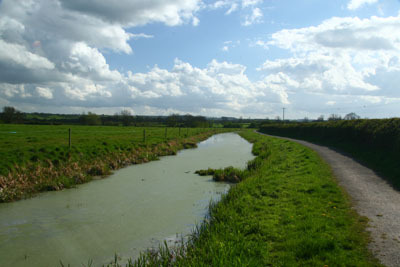 A very shallow section of the Grantham Canal in most parts choked with reeds and weed. Probably not worth venturing out to if you like comfortable fishing. At some time in the future this section may be restored to a navigable waterway which will benefit anglers. Fish are present but long walks may be required to find fishable pegs. For those wanting to have a go the directions are as follows. Members only. No Night Fishing. No Closed Season, Open all year. From the A46 Stragglethorpe Crossroads take Nottingham Road towards Cropwell Bishop for just under 1 mile. Turn right into Kinoulton Road and after just over ½ mile turn left into Colston Road, continue for 1½ miles into Colston Bassett and turn left through the village, after ¼ mile turn right into Harby Lane. Continue for 1 mile along Harby Lane and then turn right into Hose Lane, after 1½ miles turn left into Meadows Lane and travel for just over ½ mile to Bridge 39. For Bridge 37 do not turn left into Meadows Lane but continue straight on along Canal Lane for 1/3 mile. Walking the towpath back towards Nottingham and bridge 35, Smite Aquaduct may find the better pegs.